Non Sequitur: Calligraphy & Letter Art Day-to-Day 2007 Calendar | Kris Johnson's Blog…sort of. Accord Publishing has 211 “Day-to-Day” desk calendars for 2007 and 2008 listed on their website. If you’ve got a desk calendar filled with insults, misunderstood song lyrics, redneck jokes, Jeopardy questions or cross stitch patterns, there’s a good chance it was published by Accord Publishing or its parent company, Andrews McMeel Universal.The 12-month, 365-day year is © Andrews McMeel Universal. 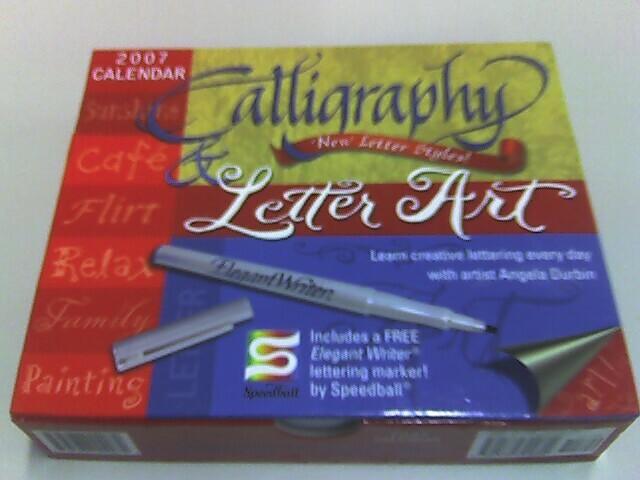 Last week I bought the Calligraphy & Letter Art™ Accord Art 2007 Day-to-Day Calendar from Half Price Books. The box “[i]ncludes a FREE Elegant Writer® lettering marker! by Speedball®”The Speedball Art Company, makers of the Elegant Writer® should not be confused with the comic book character, Speedball, who is ™ and © 2007 Marvel Characters, Inc. The former is well-known art supply company, while the latter was involved in an incident that triggered Civil War, a massive crossover event that has rocked the very foundation of the Marvel Universe., so I thought I was all set for 365 days of beautiful calligraphy. Since I’m a few weeks behind, I’ve been doing a couple of pages every night before leaving work. Each weekend introduces a new “alphabet” that is used for the following week. The first week is Chancery Italic, the second is Elder English. Last night I caught up to week three and was introduced to the Shindig alphabet. Unfortunately, Shindig is not designed to be written with the Elegant Writer® lettering marker! by Speedball®. The recommended tools are a “[f]ine-tipped black magic marker and multi-colored magic markers or colored pencils (not included).” I don’t keep colored pencils in my desk at work (not since we discontinued Craft Hour two years ago), but a black .7mm Bic Z4 rollerball pen seemed to be a decent replacement for a fine-tipped black magic marker. No problem. Flipping ahead to week four (which began on the weekend of 20 January), I see that the recommended tool for the Tuscany alphabet is a “[s]mall paintbrush with ink or watercolor (not included).” Seriously. A paintbrush. On week five (which started last weekend), the alphabet is Baltissimo, and we’re back to the fine-tipped magic marker (not included). In week six (Twinkle), it’s the paintbrush again (a size “000” sable brush is recommended). Finally, in week seven (beginning on 10 February) the Elegant Writer® lettering marker! by Speedball® becomes useful again, when the Chancery Italian alphabet makes its triumphant return. To be followed in week eight by the Savage alphabet and the damned sable brush again. Crap. The FREE Elegant Writer® lettering marker! by Speedball® is used for four out of the first 12 weeks. Sixty-six point six percent of first twelve weeks should be completed with a writing implement other than the one included in the box. A box on which, I should point out, the additional implement requirements recommendations are not listed. On the other hand, I can download a FREE Chancery Italic Practice Template from the Accord Publishing website. I don’t see anywhere I can download a FREE size “000” sable brush and watercolor paints, though. Not even from Speedball®.